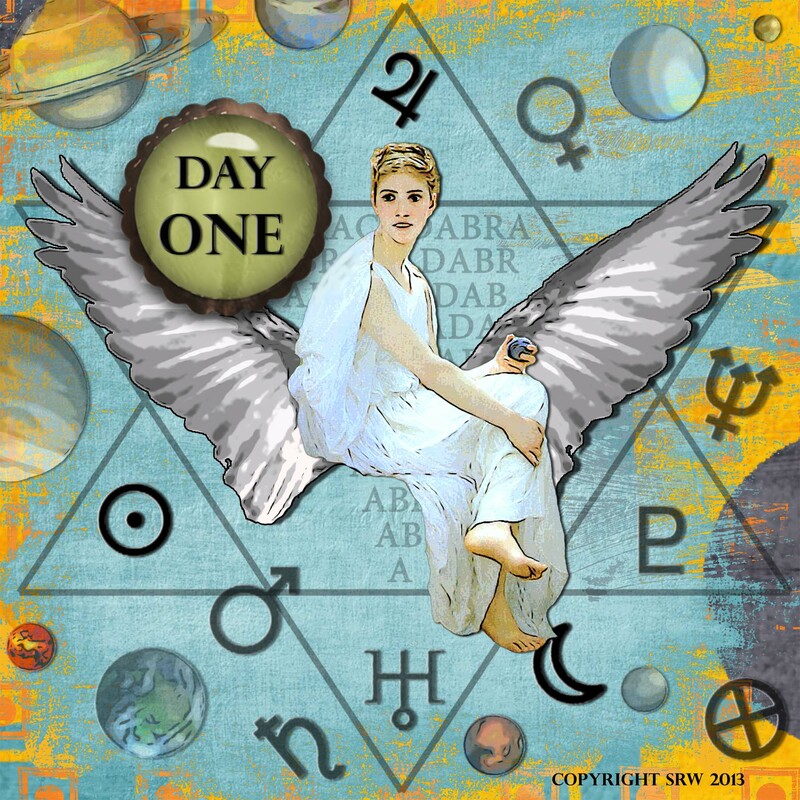 Digital Collage Art by Silver RavenWolf — Day One of the Great Release Program! Day One of the Magickal Release Challenge! * Where some of you will choose to work with Gods and Goddesses or perhaps just “Spirit”, others may like communing with the angels during the program. Angels pre-date Christianity, and many of the more well-known angelic histories are actually related to real people (see my book Angels, Companions in Magick for more info). There are several different hierarchies to choose from when dealing with the angelic realms. The basic list I’ll be using here can be found in Three Books of Occult Philosophy by Henry Cornelius Agrippa edited and Annotated by Donald Tyson and published by Llewellyn World Wide. “The list is taken from the Conciliator of Pietro d’Abano, written in 1303, but first published in Venice in 1471.” — Page 535. However, I will mention other angels as the program progresses. For the first half of the program, the Sun is in Sagittarius — this is a spiritual, go-getter fire sign with amazing adaptability. Ruled by Jupiter, the Great Benefic, Sagittarius covers adventure, good luck, knowledge, freedom, motivation and expanding horizions. Super energy for the start of the program! On Winter Solstice, the Sun moves into Capricorn — a far more serious energy focused on structure, rules, goal setting, patience, discipline, concentration and accomplishment. Ruled by Saturn, there isn’t as much razzle-dazzle as with Sagittarius; however, Capricorn can help you get the job done! Remember, the planet Saturn isn’t just about limits — it is about rewards, too! Think of the placement of the sun as the underlying melody of the program. You will notice the switch in energy on the 21st of December. We begin our program with the moon in the fourth quarter — normally seen as a time of rest, although some magickal practitioners use it for heavy banishing. If you don’t want to do any magick today — that’s fine. Throughout the program I urge you to go with your instinct. Do what feels right for you. The morning cleansing (Braucherei ritual on the last post) can be done during any moon quarter, and will not negatively impact you. However, if you choose to start it tomorrow (on the New Moon) that’s fine, too. Tomorrow we will be setting up our Release Program Altar — a special place to do our workings throughout the next 30 days. This program is for anyone of any religion — do feel free to massage it to suit your belief system and design something that speaks to your heart. Today the moon is in Scorpio, an intense energy blended with the ruler of the day — the Sun, giving us a powerful mental boost to focus in the direction we choose. If you need to bust down some big, bad stuff in your life? Scorpio and its ruler, Pluto, can do the job. During the program, you can use all of the astrological information given, some of it — or…none of it! This is entirely up to you. The notes here are merely an indication of what is available for you to work with. View the information as a tool, not as a fated circumstance. Ask yourself first...do I feel this energy? And, How can I use this energy for my benefit today? The Angel of the Day is Michael. His energy is one of success, strength, and accomplishment. His name means “Perfect of God” or “Perfection of Spirit” or “Who is God”. Originally, Michael was worshiped as a God by the Chaldeans. He also rules marriage, mercy and music. If you choose to work with the angels during the program expect to receive messages! If you receive a gift of oranges, stumble across something golden, see a butterfly, or find yourself looking at the painting of a lion — Michael is telling you that your petition has been answered. When you work with angels? Nothing is exactly as it seems! Last year we worked on speed cleaning exercises. They were so much fun I decided to keep them in the program. In the time allotted, you clean up, put away, straighten up, or throw out anything you desire. The challenge is to see how much you can get done in the time indicated. Are you ready? Okay! Today you have exactly three minutes. On your mark! Get Set! Go! (1) Made a To Do List that you can refer to throughout the program. (3) Threw out one thing — something that was broken, worn out, or in such bad shape no one would want it. Tomorrow: We will set up an altar (or sacred area) for our Release Program Work and have our overall Program Goal ready to write down. As tomorrow is a New Moon, it is Wish Day! You get to make nine of them! The moon will be in Sagittarius, double empowering the energy of that sign. Consider wishes for Good Luck, Freedom, Knowledge, Motivation, Answers, Agility, Achievement, Truth, Mental Peace, Intuition, or Finding Solutions. 2013 Great Release Program! Get Ready to Create an Awesome New You! 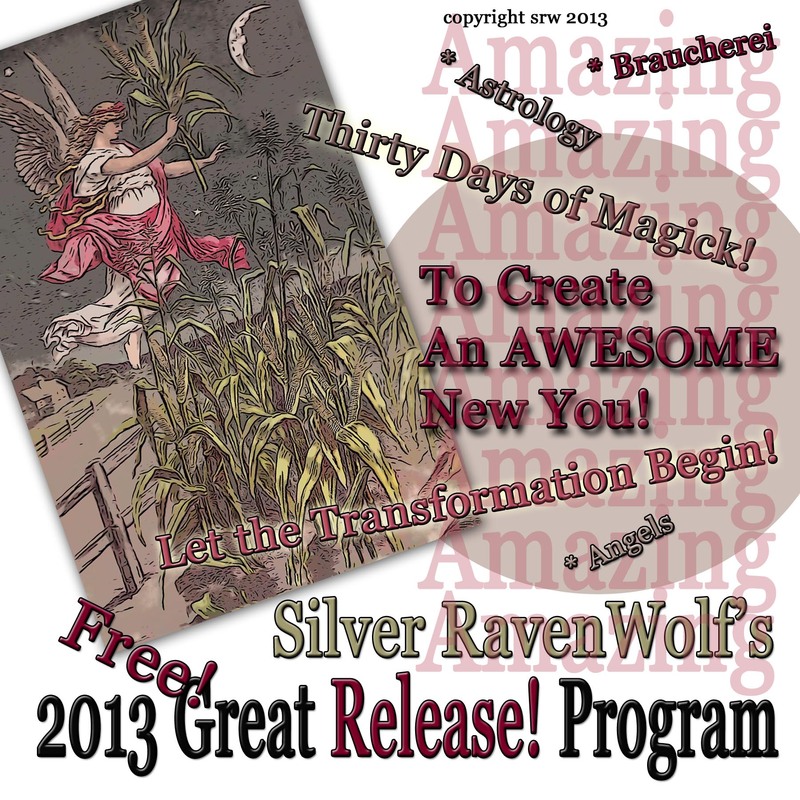 Silver RavenWolf’s 2013 Great Release Program — A Free 30-day enchanting experience! White Tea Candles (if you like working with candles). We’ll use them on various occasions. Tools: You don’t need any except your mind. However, if you would like to light a white candle, or incense — that’s fine, too. Whatever spiritual practice that facilitates calm and relaxation within yourself can be used here. This year I have added a cup of water that you will change and empower each day. Spring water is great, tap water is fine. Step Four: While you are still facing East — intone the following chant 9 times. White is a basic go-to color, and can be used for any practice in this program, including lighting the way for the Lord of the Day. You Want to Start Early? Can’t wait for December first? Great! For the next few days, consider carefully what you primary goal is going to be for this year! I’m looking forward to seeing old friends (those who have done the program before) and new friends! Please feel free to post your comments throughout the program. We are a magickal village and every post is important and unique.